Tim McGraw fragrance and perfume list. Tim McGraw (born Samuel Timothy McGraw on 1 May 1967 in Delhi, Louisianna) is an American country music singer, married to fellow country music singer Faith Hill. His singles include I Like It I Love It, It's Your Time and Live Like You Were Dying. 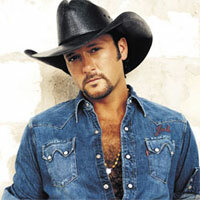 Tim McGraw launched his debut fragrance, in 2008 with Coty, Inc.